The Best of the Season at Fieldstone Artisan Breads Pumpkin tartlets are here! Bistro embraces the changing seasons and bountiful harvest in the heart of the Fraser Valley. shares her reflections of a lifetime of challenges, championships, tragedies and triumphs. smartphone technology, Indulge explores the impact our love of online tools can have when globetrotting. imagination, as we explore the trend to restyle, repurpose and reinvent decor. dreadful decorations and maybe even treating our little monsters to some candy. 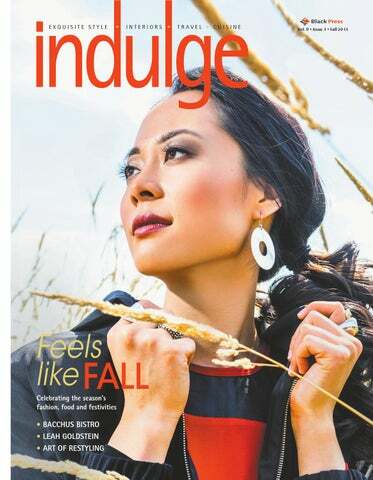 Whatever aspect of fall you enjoy most, this season's edition of Indulge is sure to get you excited about some of the food, fashion and festivities on tap in the coming months. Chef Ashley Chisham of Bacchus Bistro shares his love for the changing seasons, and some autumn-inspired recipes sure to satisfy your harvest hunger. We visit God's Little Acre Farm in South Surrey, which serves as the backdrop to showcase some fabulous fall fashions. As technology evolves and our access to information blossoms, we explore how smartphone apps and online tools have changed the way travellers discover the world. Before you clear the 'junk' out of your attic this fall, you'll want to read our feature on restyling and repurposing furniture, for some inspiration on breathing new life into old items. And prepare to be inspired by the story of Leah Goldstein; world-champion kickboxer, undercover Israeli police officer, ultra-endurance cyclist and all-around badass. As the days grow shorter – and our sleeves grow longer – we hope you enjoy this fall edition of Indulge, as well as everything the coming season has to offer. Publisher Dwayne Weidendorf publisher@indulgemagazine.ca Managing Editor Lance Peverley managingeditor@indulgemagazine.ca Editor Melissa Smalley editor@indulgemagazine.ca Creative Services Manager Jim Chmelyk creativeservices@indulgemagazine.ca Contributors Alfonso Arnold • Sarah D'Arcey • Jason McRobbie • Rob Newell • Karley Stroscher Indulge is published four times annually by Black Press Suite 200 2411 160 St. Surrey, BC V3Z 0C8 Tel: 604-542-7429 Fax: 604-531-7977 www.indulgemagazine.ca Distributed free to select households in the Lower Mainland of British Columbia. Paid subscriptions available. Reproduction in whole or in part is prohibited. The publisher is not responsible for unsolicited manuscripts or photographs. Every parent wants the best for their children. If best means a school that will give your child the opportunity to develop into the person that only he or she can become – in a place where the journey is celebrated – we invite you to explore what Southridge can offer your family. from Mt. Lehman is incredible and they have some of the best cheeses around, all sorts of goat cheeses.” “Then there are all the fresh cranberries. We have 100 acres right next door,” he says with a youthful smile that belies two decades of quality kitchen time, the past 11 years at Bacchus Bistro. “It really is a lovely pocket of the world and a great place to raise kids. It’s also a great place to come explore and not all that far from Vancouver, but a world away.” Vancouver-born and trained, Chisham grew up in a house filled with the aromas of his mother’s perogies and cabbage rolls, and found the allure of the kitchen early on. “I pulled off my first homemade soup when I was five and never really looked back,” he admits. “Over the years, I have come to understand that it’s not something you do for a living alone. It has to be who you are.” That philosophy has been learned and earned over the course of a culinary career that has ranged from Hazelmere Golf Course to Cielo’s to Wolfie’s, where he apprenticed for six years on the White Rock waterfront under Chef John Kavanagh for whom he has the highest esteem. Those guests have been coming in greater numbers over the past decade, as have the accolades accrued by Bacchus Bistro and the celebrated wines of Chaberton Estate Winery – overseen in the blending and finishing by co-owner Anthony Cheng. For Chisham, the extensive portfolio, highlighted by their 'AC' series wines, offers such a wealth of pairing opportunities, he considers himself fortunate. “There is a real depth in the list, so I can really focus on food, and then find any number of great pairings,” says Chisham, whose winepairing dinners have found an avid following. “Above all else, we’re inclusive and accessible to newcomers and wine experts alike.” Good food is the magic element which brings it all together, but it is elementary to Chisham. “If you find really good ingredients, you don’t have to do much. Instead, you have to watch for overdoing it," he said. "When you first start in this industry, you think you need to change the world with each dish. What I have learned is that I just want to make good food that people truly enjoy. That’s enough, but that’s a lot." oven for approximately 20 minutes—gently tossing once—until vegetables are soft and beginning to take on a bit of colour. Remove from oven, sprinkle evenly with za’atar to taste, and lightly drizzle with pomegranate molasses. Top with chopped parsley before tossing to evenly mix. Taste and adjust seasoning with additional za’atar as desired. Roasted Cornish Game Hens 2 game hens, around 2½ pounds each 2 Tbsp butter, softened 6 sprigs fresh thyme 1 onion, sliced salt/pepper Preheat oven to 400°F. Rub game hens with butter, place sprigs of fresh thyme inside each hen, and tie the legs together with butcher's twine. Generously season with salt and pepper. Place the game hens on a bed of sliced onions in a small roasting pan, then place in the oven on the middle rack. After 10 minutes, lower oven temperature to 325°F. Continue to roast for another 35 minutes. Check hens with a meat thermometer inserted into the thigh – should read 175°F. If it not ready yet, continue roasting and check every 10 minutes. To serve, split each hen into two halves and place on top of the roasted squash. Add sugar to a small saucepan with just enough water to cover. Place pot over high heat and bring sugar to a boil. Cook without stirring until sugar forms a “blonde” or pale golden coloured caramel. Quickly add cranberries all at once and stir to coat; the sugar will harden quickly, so don’t panic if it sticks together and is not evenly coated at this point. Now add the orange juice and zest and simmer for eight minutes – until all sugar is dissolved and the cranberries are beginning to soften. URBAN ROMANCE TRADITIONAL look with a MODERN sensibility... Its elegant and bold, with a certain feminine overlay. Pumpkin Spice Mix Three-finger pinch of ground cinnamon and ground ginger Two-finger pinch of ground cloves and salt Mix all ingredients together for 'royale' including pumpkin spice mix with a whisk, being careful not to incorporate too much air. Add the diced bread and gently mix with hands or rubber spatula being careful not to break the bread into mush. Preheat oven to 325°F. Rub the insides of eight 8 oz. ramekins with butter and evenly coat with about ½ tsp of sugar. Evenly divide the bread-pudding mixture between the eight ramekins and place in a baking dish (a lasagna dish would work perfect). Add warm water to the dish, filling until the water comes halfway up the sides of the ramekins. Loosely cover with aluminium foil and place in preheated oven for 40 minutes or until a pairing knife comes out clean when inserted in to the middle of a pudding. Carefully remove the ramekins and set aside to cool slightly and serve warm with whipped cream or vanilla ice cream and caramel sauce. This recipe can be done a day in advance if the bread puddings are cooled quickly then tightly covered. Just reheat before you serve…or eat them cold for breakfast! Add the balsamic glaze and cook for three minutes more – an excellent sauce for your game hens is now ready! We proudly handcraft our chocolate confections using only the finest natural ingredients and no artificial preservatives. off #137 -1959 152nd Street, South Surrey. t: 604.538.6722 e: whiterockeyecare@live.ca frames Complete Eyelasses purchase necessary. See in store for details. Not valid with other offers. Order now for your holiday gifts & corporate clients! 59 152nd Street,necessary. South Surrey. t: store 604.538.6722 whiterockeyecare@live.ca lasses purchase See in for details.e: Not valid with other offers. Complete Eyelasses purchase necessary. See in store for details. Not valid with other offers. Complete Eyelasses purchase necessary. See in store for details. Not valid with other offers. ycling though a deserted stretch of highway in Kansas, Leah Goldstein squints her eyes. A strong crosswind blows sand into her face, peppering her cheeks like a hundred fiery needles. Her vision begins to blur until all she can see is a white line ahead of her bike, as she tries to ignore the nauseating pain shooting through her neck. Her head heavy, her eyelids drooping, hallucinations begin to take over any rational thoughts that may have been circling inside her pounding head. She's unsure how she will make it through the next couple of hours, let alone the next thousand miles. Goldstein's experience in 2011 competing in Race Across America – a more than 3,000-mile ultra-endurance cycling race from California to Maine – is but one instance of the Vancouver native pushing herself to the brink of survival. Leah Goldstein, top right, a national kickboxing champion at 15; inset, during Israeli military training. a mere three months after she was almost killed, Goldstein was back on her road bike. Though she never lost faith in herself, she found the cycling community did. Upon her return to competition, she couldn't secure a spot with a professional team. Competing independently, in 2006, Goldstein had her best year yet, with 12 major wins around the world, including two recordbreaking hill climbs. Goldstein continued on the racing circuit for the next couple of years – winning the Tour de White Rock's road race in the women's division in 2007 – while testing the waters of ultraendurance racing with the Furnace Creek 508, a 500-mile race in California's Death Valley. Then, in 2010, while warming up for a race, Goldstein was hit by a car; the accident snapped her right arm and crushed her left, ultimately sealing the fate of her pro-racing career. Though retired from the pro circuit, she returned from that injury to compete in more ultra-endurance races, the pinnacle of which was her participation in the 2011 Race Across America. "Only a very small percentage of people are stupid enough to do it," Goldstein laughs, while describing the fringe cross-country race. Goldstein's autobiography is told from the perspective of the 11 days she spent competing in the race, battling crippling fatigue, extreme weather, and a condition known as Shermer's Neck, in which her neck muscles completely gave out, making it impossible to support her head without assistance. Sleeping, eating and resting for only a few hours a day, Goldstein spent the rest of the time on her bike, battling her way across 10 states from the west to east coast. The book, which flashes back between Race Across America and her earlier life, reflects the sometimes hallucinatory experience, she said. "You're on your bike for 20-plus hours in one shot, you start thinking about everything," Goldstein says. "You start getting mad about something that happened 15 years ago." Call the friendly folks at Check Point for your... • Furnace • Water Heater • Boiler • Gas Lines • Plumbing • Renovations • Instant Hot Water Heater • Experts in Handicap Style Toilets & Grab Bars! CHECK POINT PLUMBING & HEATING INC. I N T E R N AT I O N A L COLLECTION has arrived! has arrived at EDGE... Fashion on the Edge! 2016 Cruisewear has arrived! Specializing in bra cup sizes up to J, long & short torso, mastectomy suits, polyester suits and plus sizes. FASHION CLINIC at 4 and 6:30 - please RSVP to secure your spot as space is limited. Draw for Sympli piece. The look: On the cover, and page 15: Elana is ready to face the cooler weather in this Anatomie ensemble, including top, pant and windbreaker, all available at Anna Kristina Boutique (604-536-8873), paired with France Mode Zemon boots from Turner Shoes (604-535-5119) and rings and earrings from Just Jewelry (604-541-6362). Page 13: Celebrating the season of harvest, Elana is wearing Kut boyfriend jeans, a Michael Kors cardigan and belt and Dissona handbag, all from Zig Zag Fashion Boutique (604-535-1536) with accessories from Just Jewelry. Page 14, far left: Elana is wearing Kut Mia skinny toothpick jeans, with Tribal brown cape sweater and Tribal jacket all from Zig Zag and accessories from Just Jewelry. Page 14, top right and opposite page: Shopping in style, Elana is wearing embellished Jane and John jeans, a button up Daila Dalla Valle blouse and fur jacket by Elisa Cavaletti, all from Anna Kristina Boutique. Rings and necklaces are from Just Jewelry and Hispanitas shoes are from Turner Shoes. Page 14, bottom right and page 4: Red Simon Chang fringed sweater, black Tribal leggings and Steve Madden shoes, all from Zig Zag, paired with a necklace from Just Jewelry. The location: God's Little Acre Farm, located in South Surrey, was founded in 2011 by Jas Singh, who had a vision of dedicating his crops to the needy. Since then, with the help of countless volunteers from around the Lower Mainland, the farm has donated more than 300,000 pounds of produce to charities and food banks. Last year, the farm opened its first market, selling produce harvested on site in an effort to support the many expenses for supplies and machinery. Volunteers are always welcome to come and lend a helping hand – visit www.godslittleacrefarm.com to find out more. Despite the surprise, Kent said she had a nice huge impact on the industry is called Air BnB. evening with the couple, who made her crepes Founded in California in 2008, it's described for dinner and shared insight into places she as a "trusted community marketplace" should see and how to navigate the city. for people to discover and book unique The next day, however, things took a turn accommodations around the world. when the woman went into labour. Air BnB features a database of 1.5 million As the couple headed to the hospital, Kent listings in 34,000 cities – ranging from full pondered what she should do. The boyfriend houses to apartments, bedrooms or simply returned the next morning to fetch some a couch to crash on – that hosts rent out to belongings and, unable to communicate with guests at a pre-determined nightly charge. him about the situation, Kent decided to leave. The identity of both hosts and guests are "I was never refunded for the night that I verified, payment and communication takes didn't stay," she said. "I didn't ask to be, but place securely through the website and I thought as a courtesy I should have been, insurance protection is also available, along just because I ended up spending money on a with a plethora of safety tips online for both hotel." parties. Though it However, despite makes for a the safeguards, there great travel story, is still an element Kent's experience of uncertainty when highlights the staying in a stranger's importance of doing home, as Coquitlam thorough research resident Lisa Kent and finding out as discovered while much information travelling in Europe about your Air BnB last fall. host as possible Kent, 33, spent a ahead of time. month exploring "The thing that several countries, shocked me even mostly on her own, more than her staying in a variety being pregnant of accommodations was the fact that along the way, she was living with including hotels, her boyfriend, and B&Bs and a few didn't say anything," hostels. Kent said. "What if I After previously was uncomfortable staying in a home staying there? I she booked would have had to through Air BnB go find some place in London, which else to stay. And she described as a that could be a huge "lovely experience," problem in a place Kent decided to use like Paris." the app again to stay Despite her visit in a woman's small Lisa Kent visits the Arc de Triomphe in Paris not working out apartment in Paris. quite as planned, Having Kent said she would use Air BnB again, corresponded with the woman via email, Kent depending on which city she was visiting, as it had arranged to sleep on her couch for the offers a more unusual and 'homey' experience four nights she'd be in the city. than a hotel or a hostel. When she arrived, however, two things Newell on the other hand – a longtime travel caught her by surprise: the woman was nine consultant who has ventured to the far reaches months pregnant, and she had a live-in of the globe – recommends always booking boyfriend who spoke no English. with experienced agents, especially if you are Neither of these details were mentioned taking an extended trip with a complicated in her Air BnB profile nor in their itinerary. correspondence. "The right travel consultant will have insight "I wouldn't have stayed with her had I into which companies are the best to book known that she was nine months pregnant with," Newell said. "They can get you the best and that her boyfriend was living with her," deal, and they'll ensure that every detail of Kent said. "That's something that should have your reservation is made properly." been stated ahead of time." Popular Travel Apps Google Translate This app has voice-translating capabilities, essentially allowing you to use your phone as an interpreter. You can also use your phone's camera function to use the app to read signs, menus and other foreign typography. Transit App This is a must-have app when travelling without a car, allowing you to see every public transportation option available to you in a specific area and pick the fastest route. Compatible with transit systems in 87 metropolitan areas around the world. Provides real-time information such as bus locates, schedules and route itineraries. RelayRides Bringing the peer-to-peer concept into the rental car world, RelayRides allows car owners to list their vehicles online for travellers to rent. Listers and renters are both fully insured, and vehicle rental comes with 24/7 roadside assistance and support. Owners are able to personally approve renters on a case-by-case basis. 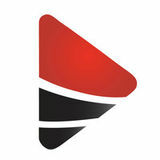 Google Maps Providing comprehensive, accurate maps in 220 countries, this app is essential for travelling. Includes live traffic conditions, incident reports and automatic rerouting, plus detailed info for more than 100 million places and street view options. You can also save maps for offline use, should you be without Wifi or beyond data range. Day One This journaling app is extremely userfriendly, making it the perfect tool for a sleep deprived traveller to document their journey. It's passcode protected, and each entry is automatically date and location stamped. Entries can be organized with tags and photos are easy to add. WhatsApp The ultimate app for keeping in touch with friends and family far and wide. Send istant text and photo messages across international borders, with no additional service charges. Create chat groups across different phone platforms (iPhone, BlackBerry, Android, Windows and Nokia). – into something completely new and unexpected. "We make the old look new and the new look old," Hannem explained. Potential treasures can be found almost anywhere; Hannem said she often scours old movie sets for props, sometimes altering them into large pieces of artwork. "It's amazing what's out there that you can really reuse on a grand scale," she said, noting the art of repurposing goes far beyond simply repainting an old piece of furniture. Ed Barnett, a 35-year hobbyist woodworker with a shop in Langley, started a custom repurposed furniture business about a year ago, after the company he was working for shut down. His interest in the craft comes from the notion that items shouldn't be discarded just because they've outlived their initial purpose. "I don't want to see anything go into a landfill if it can be repurposed and built into something else," Barnett said. Among the dozens of creations Barnet has made over the past several months are wine racks made of black iron pipe, kitchen lighting made from vegetable graters, masonjar chandeliers, and a deck chair made from driftwood and up-cycled fire hose. "Right now I'm working on an eight-seater dining table made of old yellow cedar fence boards," Barnett said. "It's just incredible." Barnett finds inspiration on local beach shores, where he combs for driftwood and other pieces of lumber that can be used to create something unique. "If I see an old barn or an old fence falling down, I'll approach the person and ask if I can get some of the wood," he said. "It comes from anywhere and everywhere." In terms of parameters of creating something, Barnett said the "sky's the limit." The repurposed furniture movement is growing, he said, as people search for more "outside the box" looks for their homes and workplaces, including 'steampunk' styles, described as a mix between Victorian elegance and strong industrial elements. Hannem agrees that restyling of old items is fast becoming a growing trend, noting the reasonable cost and easy installation of many of the items she has worked on in her store. "People are finally finding that unique is the way to go," she said. Proof of its popularity is the upcoming Vintage and Revamped Market, the fifth of its kind in recent years, to be held at the Cloverdale Agriplex on Oct. 3 and 4. The last market, held in the spring, saw close to 5,000 people attend, Hammen, the market's founder, said. The market features an assortment of artisans, furniture pickers, antique dealers and home-based entrepreneurs, sharing their reinvented and revamped furniture and artwork pieces with the masses. "It's a European-inspired fair, featuring local artisans with local products," Hannem explained. "It's a way to introduce all these amazing local artisans with each other and the public, and bring them all together." Top: a few of the restyled pieces found at Langley's ReVamp Furniture Garage. Middle: a deck chair, made by Ed Barnett out of a root stump found on the beach, and recycled fire hose. Bottom: another of Barnett's creations, a boardroom table made of salvaged yellow cedar dock boards. • Michael Cutting winds up for a swing at the Semiahmoo House Society's annual charity golf tournament at Morgan Creek Golf Course Sept. 3. • Four-year-old Sydney Erickson has a brush with royalty meeting Queen Elsa, from Disney's Frozen at the sixth annual White Rock Princess Party Aug. 22. Oct. 18. Registration takes place at 8 a.m. at White Rock's Bayview Park, with the race – which includes one- and five-km routes – kicking off at 9 a.m.
• The Peninsula Community Foundation's premier fundraising event Vintage Affair returns Oct. 22 at Hazelmere Golf and Country Club. Visit www.peninsulafoundation.ca for ticket info. NEW FALL STYLES ARRIVING DAILY! VACCINATION SPECIAL EVERY WEDNESDAY MOST VACCINES FOR ONLY $10.00 Exam Required Call for more details! THITHI S S YEAYEA R! R! Meet at the beach and Meet at the beach and et at the beach and Meet at beach and SSS uor u nor ndda 1555 walk run for your walk run for your dathe S 0115ER a u u y y , ,2202001ER , , 8 8 n n O O 1 1 c c r r t t e e o o b b d a 2 y y , , , , 8 8 O O 1 1 c c r r t t e e o o b b walk or run for your ER walk orrun run foryour yourER ER k or run foror your ER walk for Register Register Online Online – It’s – It’s Easy! Easy! Gemini Visuals Peninsula Runners DMCL Chartered Professional Accountants Gemini Visuals Title Sponsor Gold Sponsor Media Media Sponsor Sponsor Title Sponsor Silver Sponsors Gold Community Community Partners Partners hitecture Interior Design and Planning Ltd. Gold Sponsor Gold Sponsor rkets DMCL Chartered Professional Accountants Title Sponsor Sponsor Online – It’s Easy!